If you are using nothing but the plain Win32-API you might have a lot of struggles when you want to perform more complicated drawing actions in your window or control. Loading compressed image formats like PNG or JPG requires a lot of work and your code pretty soon starts to get bloated.For that reason Microsoft added a new feature to Windows with XP which is called GDI+. If you need it on an older platform you can install it using Windows Update back till Windows 2000. Now whats GDI+? Pretty simple: Its a library containing a lot (and by that I mean A LOT) of features that help you working with everything related to windows graphics. As the name suggests it supersedes the traditional GDI. The functions are pretty easy to understand, we call GdiplusStartup to start GDI+ and GdiplusShutdown to shut it down. GdiplusStartup has two additional parameters, a GdiplusStartupInput and a GdiplusStartupOutput. With the input you can control a few settings like which version should be loaded. Just passing the default object is fair enough for most cases. The GdiplusStartupOutput parameter gets populated by the function and then contains two function pointers that have to be called if you specified in the input that the background thread should be suspended. You see: Most likely you will never use that! You can also use the startup-function to load resources that persist over the entire lifetime of GDI+ and then delete them in shutdown. I did this for the pen I will be using later to draw my shape. It creates a pen with a stroke width of 3 and the color IndianRed. Drawing is now done at the same place it is for regular GDI drawings - in WM_PAINT. You use the HDC from BeginPaint to and then draw the actions to that context. 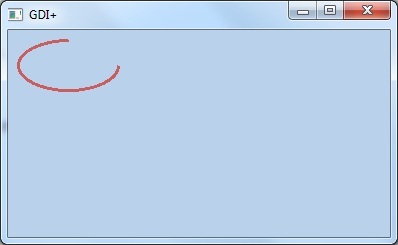 I created a function drawGDI which takes the HDC and then performs the painting. 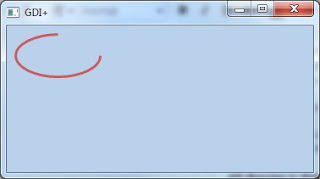 Now you can play with the different functions like DrawLine, DrawRectangle and so on and we will meet for the next part when you are ready to draw some images!